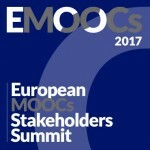 EMOOCs 2017, the 5th European MOOCs Stakeholders Summit, was held on 22–26 May 2017 in Leganés (Spain). Organized by the Carlos III University of Madrid (UC3M), the event has gathered worldwide actors involved in the Massive Open Online Courses (MOOCs) phenomenon, from policy makers to practitioners and researchers. The conference included five tracks (Experience Track, Research Track, Policy Track, Business Track, and Spanish Track) and several Workshops. EMOOCs 2017 was co-located with the OPENedX conference 2017. The top universities and organizations in production and distribution of MOOCs participated in the conference. The best example of this was the plenary panel session in the afternoon of Tuesday 23, “The ten questions you would not like us to ask“, were Pierre Dillenbourg of the École polytechnique fédérale de Lausanne (EPFL) interviewed Anant Argawal (CEO, edX), Carolina Jeux Conde (CEO, Telefònica Educació Digital; MiríadaX representative), Rick Levin (CEO, Coursera) and Simon Nelson (Chief Executive, FutureLearn). The MLLP’s Gonçal Garcés Díaz-Munío participated in the Business Track session “Automated translation” (Tuesday 23 May, at 10:30) with a presentation on “Integrating automatic subtitling and translation into MOOCs with poliTrans”. In this presentation, we showed the MLLP’s experience and proposals as a provider of subtitling technology support for different organizations (including the new UPV poliTrans service for automatic multilingual subtitling), along with the most recent advances in the fields of speech recognition (ASR), machine translation (MT) and text-to-speech synthesis (TTS) using deep neural networks for multilingual subtitling, text translation and accessibility. With our experience in several European projects (transLectures, EMMA) and technology transfer contract, we showed these advances within the context of actual application experiences with the educational community and with user evaluations. You can watch here the recording of the MLLP’s presentation. Additionally, you can watch all other presentations from EMOOCs 2017 on YouTube (have a look at the EMOOCs 2017 programme first if you want more details and the descriptions of the presentations). The next edition of EMOOCs will take place in Delft (Netherlands), organized by the Leiden-Delft-Erasmus Centre for Education and Learning (LDE-CEL). We look forward to another fruitful event! The MLLP presentation at EMOOCs 2017: “Integrating automatic subtitling and translation into MOOCs with poliTrans”. Watch here the presentation’s recording (at 19:24 in the video). Posted in All, Events, Videos and tagged #emoocs2017, Conferences, Educational Technologies, MOOC, poliTrans.